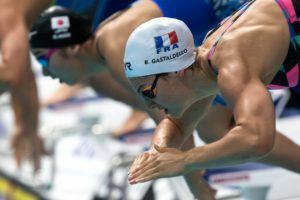 The 21st edition of the Bolzano Swim Meeting took place over the past 2 days, with Italian swimmer Fabio Scozzoli and visiting Dutch athlete Kira Toussaint stealing the show with 3 wins and 2 meet records apiece. Notable Americans Madison Kennedy and Kendyl Stewart were also in the mix, as was German Marius Kusch and emerging breaststroking phenom Nicolo Martinenghi in front of his home crowd. 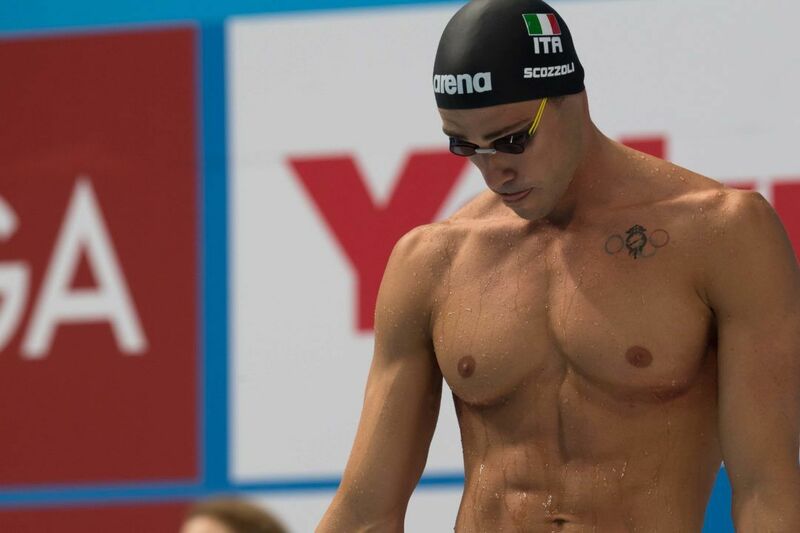 29-year-old Scozzoli crushed his 15th overall meet title at the annual Bolzano meet, taking the men’s 50m breaststroke, 100m IM and 100m breaststroke events. 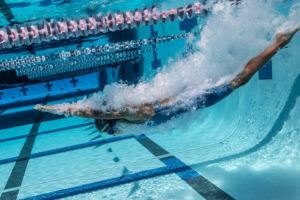 In the splash n’ dash, Scozzoli nailed a meet record of 26.21 to beat out Brazilian Felipe Lima, who touched over a half a second behind in 26.83. Martingenghi settled for bronze in 26.90. In the 100m IM, Scozzoli soared to the top of the podium in a time of 54.61, beating out teammate Simone Sabbioni in the process. Sabbioni clocked a time of 54.81 to collect a silver medal in the race. Finally on day 2, Scozzoli took the men’s 100m breaststroke title in a swift 58.65, enough to hold off the 18-year-old Martinenghi by just .10 of a second. Scozzoli coasted into a new meet record in the process. 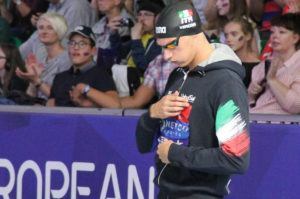 As for Martinenghi, the teen holds the World Junior Records in the 50m breaststroke and 100m breaststroke in times of 26.97 and 59.01, respectively, but has a way to go on the short course front. Russia’s Anton Chupkov holds the short course 100m mark in a speedy 57.61 set back in 2015 and Martinenghi’s personal best on the short course is 58.21 from March of this year. Dutch Olympian Toussaint kicked off her Bolzano campaign with a solid win in the 100m freestyle, beating the field with her winning mark of 54.10. About a half a second behind for silver was Italy’s Aglaia Rezzato in 54.59, with Kennedy taking bronze in 54.76. Toussaint’s next victim was the 100m backstroke, where the former Tennessee swimmer punched a new meet record-setting swim of 58.16. Only Italy’s Margherita Panziera was able to follow suit and dip under the minuet threshold, stopping the clock in 58.48 for silver. Finally, the women’s 50m backstroke also saw its meet mark bite the dust courtesy of Toussaint, with the Dutch racer clocking 27.12 for the gold. That edged out her own meet mark of 27.15 set back at the 2015 edition of the meet. Kennedy won the women’s 50m freestyle in a time of 24.88 to represent the only swimmer in the field to delve into sub-25 second territory. Kennedy’s victory clinched the veteran’s 5th overall title in the event in Bolzano over the years. The men’s 50m freestyle victor was Italian record holder Marco Orsi, who punched the only time under 22 seconds in 21.90. He had taken the men’s 100m freestyle earlier in the meet in a time of 48.49, marking his 11th overall victory historically at this meet. Stewart came out on top in the women’s 50m butterfly, clocking 26.24 to win the race. She followed that up with another victory in the 100m butterfly, notching the only result under 58 seconds in 57.99. 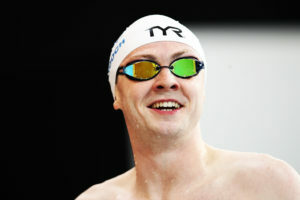 Germany’s Kusch won the men’s 100m butterfly in 50.95 over Italian Matteo Rivolta‘s 52.07.